Great question raised by ABC News on why can't we contact 911 using texting (except for Black Hawk County, Iowa--population 130,000!). I would extend on the question and suggest that we be able to contact 911 by any number of ubiquitous technologies whether texting, instant messaging, email, or even potentially social media sites (e.g. 911 on Facebook). Frankly, if someone is in trouble, they shouldn't have to get to a phone anymore, but rather they should simply be able to contact emergency services from wherever and whatever they are doing as long as they are connected--whether by desktops, laptops, tablets, and smartphones, help should be just a message away. Moreover, by capturing photos, videos, and voice, we can send a more multimedia, data-rich stream of information to 911, enabling them to better assess and respond to the situation. We owe it to both those in need of help and those emergency service providers to link them through more types of communications services and more information-rich media. I believe that the excuse that people will make more mistakes texting doesn't ring true in an information economy where Americans send 5 1/2 billion text messages a day. In fact, a mistaken text is better than no text! The key is to evolve our capabilities and not stay static in 50 year old technology, just because. With all due respect to the greatness that AOL once was, enough is enough with their fledgling attempts to reinvent themselves. OMG, the time has come, do not resuscitate (DNR) as AOL anymore. Bloomberg Businessweek (March 28-April 3, 2011) reports "AOL Tries for Something New: Silicon Valley Cred...a new Palo Alto workspace." Aside from the new digs, AOL has put a long-whiteboard along the hallway with the phase "AOL is cool." But as the article says "Nothing is less cool than professing one's coolness, of course, especially if you're an Internet dinosaur evoking a bygone era of dial-up modems." AOL was one of the hottest tech stocks in the 1990s, only to go down in one of the worst mergers in history to Time Warner. 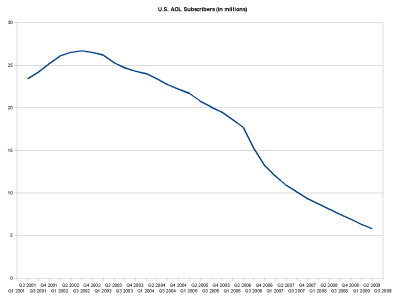 AOL's market capitalization peaked in December 1999 at $222 billion and now is at $2 billion. In 2002, AOL Time Warner was forced to write-off goodwill of $99 billion--at the time, the largest loss ever reported by a company. Let's face it, AOL is not the same company it once was--it has become a shadow of its former self. And it is flailing, trying desperately to reinvent itself, most recently with its purchase of The Huffington Post. In my mind, one of the big problems is that rather than recognize that AOL is over, dead, kaput, and that it taints whatever it touches, it just keeps reaching out to more and more victims. AOL needs to shut down as its former self and restart under a new name with a new identity for the new technology world it is entering a decade later! If it really wants to "expunge the ghosts and start fresh" then it needs to relinquish the past including the AOL moniker and become a new company for a new age. Dial up modems are long gone and not missed, thank you. With so much chaos going on in the world (natural disasters, political turmoil, extremism/terrorists, multiple wars, economic slump, and more), our society is under enormous pressure. The images of suffering from around the world recently seems to be rising exponentially with the near simultaneous Japanese earthquake, tsunami, and nuclear accidents, the fighting all around the Middle-East, the not too distant Deepwater Horizon oil spill that went on for 3 months, and virtually all the world economies under duress. 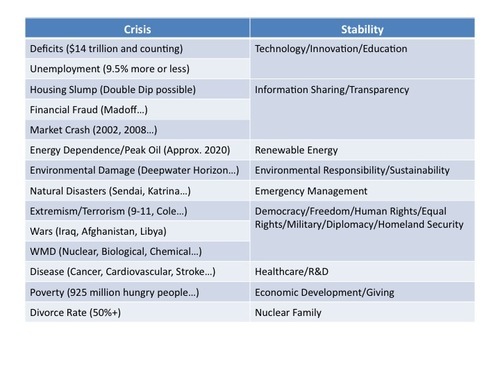 Here is a quick chart of the crisis factors (on the left) seemingly tearing at our society as well as stabilizing factors (on the right) that are healing to it. While at times, the challenges we face may seem insurmountable, we can remember that our capacity as human beings and as a society to adapt and grow is enormous. Let's hold on to our beliefs and work together as a stabilizing force for social order and good in the world (a place where crisis is no longer a stranger, indeed). 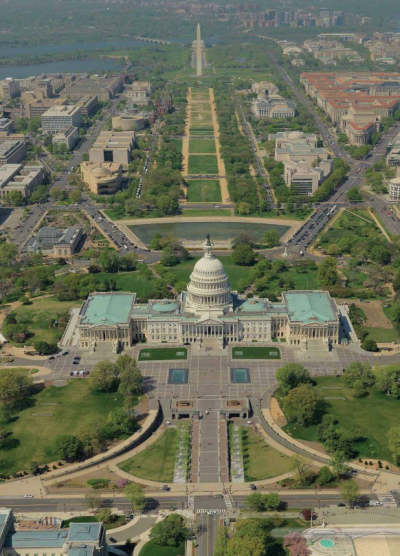 Completely awesome picture of The Capitol of the United States. The Wall Street Journal (21 March 2011) published an article on the results of a study by Universum of over 10,000 professionals with between 1 and 8 years of work experience identifying who their ideal employers are and these are the results. The complete ranking of all 150 employers can be found here. 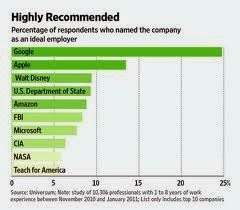 The results were derived from young professionals picking up to 5 ideal employers from the list of 150. Respondents could also write-in employers not listed and the top one's requested were Facebook (with 600 million members are climbing, no surprise), Department of Homeland Security (critical mission, don't know why they weren't on the original list of 150), and the United Nations (the "great melting pot" as they say in NY). The list provides some food for thought for those thinking about their own career aspirations--whether just starting out or looking to make a change. This blog contains a powerful poem called Whispers. It's about the destructive effects that negative people can have in our lives. Each of us has lots of challenges, but with great inner strength and surrounded by good people and positive energy we can overcome and thrive. So mean that an aura of evilness surrounds them with their perfect clothes, ornate makeup, and flawless faces. 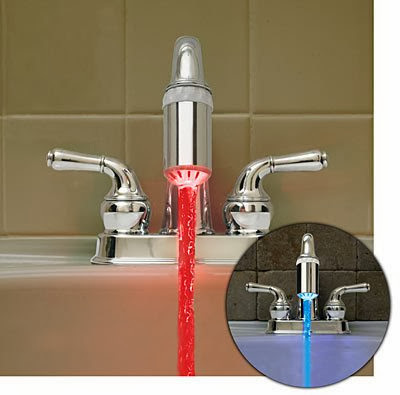 So check this out--H2Glow has an LED faucet light that it temperature sensitive and turns blue for cold water and red for hot. When I saw this, I thought this would be a great metaphor for managing the information flow from our organizations--where we could quickly and simply see whether the information flowing was sharable and for public consumption ("blue") or whether something was private and proprietary ("red"). The Economist, 24 February 2011, in an article called "The Leaky Corporation" writes: "Digital information is easy not only to store, but also to leak. Companies must decide what they really need to keep secret, and how best to do so." Like a faucet that gushes water, our organizations are releasing information--some with intent (where we are in control) and much without (due is spillage and pilferage). In the age of WikiLeaks, computer hackers, criminals, terrorists, and hostile nation states, as well as the insider threat, information is leaking out uncontrollably from our organizations and this puts our vital competitive information, national secrets, and personal privacy information at risk (i.e. health, financial, identity, and so on). Of course, we want the proverbial blue light to go on and information to be shared appropriately for collaboration and transparency, but at the same time, we need to know that the light will turn red and the information will stop, when information is justifiably private and needs to be kept that way. Being an open and progressive society, doesn't mean that that there is only cold water and one color--blue. But rather, that we can discern the difference between cold and hot, blue and red, and turn the faucet on and off, accordingly. Information is proliferating rapidly, and according to IDC, a market research firm, the "digital universe" is expected to "increase to 35 zettabytes by 2020." --a zettabyte is 1 trillion gigabytes or the equivalent of 250 billion DVDs. Therefore, the necessity of filtering all this digitally available information for inside use and outside consumption is going to become more and more critical. 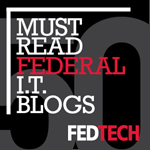 - Enterprise Content Management--to "keep tabs on digital content, classify it, and define who has access to it." - Data Loss Prevention--using "software that sits at the edge of a firm's network and inspects the outgoing data traffic." - Network Forensics--"keep an eye on everything in the a corporate network and thus...detect a leaker." Of course, as the Ciso chief security officer says: "technology can't solve the problem, just lower the probability of accidents." In the end, we need to make sure people understand the vulnerability and the dangers of sharing the "red" information. We can focus our employees on protecting the most critical information elements of the organization by a using a risk management approach, so that information with the high probability of a leak and with the greatest possible negative impact to the organization is filtered and protected the most. The leaky faucet is a broken faucet and in this case we are all the plumbers. I was searching for just the right clip for how I feel about determination and perseverance, discipline and focus--and this is it. Fight the good fight--Go Rocky! In spite of all the wealth creation and technological progress we have experienced in recent times, the real stickler is that most people seem unhappier than ever. This is not just an observation: According to the results of the World Values Survey and the General Social Survey of the National Opinion Research Center, "people have grown continuously more depressed over the last half-century." (Psychology Today, April 2011). And the depression and unhappiness that we are suffering as a society has been linked to overinflated and unrealistic expectations. I guess the average home size of approximately 2,400 square feet, more than DOUBLE that of fifty years ago, hasn't made that much difference in people's level of happiness. Psychologist Tim Kasser states: "The more people focus on the materialist pathway to happiness, the less happy they tend to be." And more forebodingly, "The less happy they make others." --Can anyone say "50% divorce rate and rising?" Writing about America in the early 19th century, the French philosopher Alexis de Tocqueville already observed: "I know of no other country where love of money has such a grip on men's hearts." I remember growing up in a modest way, but walking past all the mansions in the community regularly. In my mind I lived "on the other side of town." On the one hand, this was motivating to me in the sense that I felt like I could "make it" too. On the other hand, thinking about it left me feeling empty, because materialism was not what I believed to be REALLY important. I still don't. Over time, I came to see money practically, for what it was: a way of paying the bills. But my true passion lay elsewhere. Commitment to G-d, family and nation, and productive hard work in its own right--is more meaningful and joyful to me. 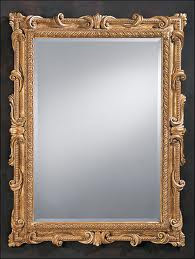 Today, I still enjoy looking at the mansions on Bravo's Millionaire Listing or HGTV. But I only let myself do that when I'm working out on the treadmill! 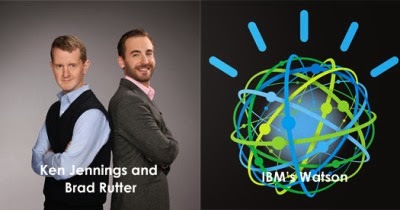 With IBM's Watson beating the pants off Jennings and Rutter in Jeopardy, a lot of people want to know can computers can really think? Both sides of this debate have shown up in the last few weeks in some fascinating editorials in the Wall Street Journal. On one hand, on 23 February 2011, John Searle of the University of California, Berkeley wrote that "IBM invented an ingenious program--not a computer that can think." According to Searle, Watson (or any computer for that matter) is not thinking but is simulating thinking. In his most passionate expression, Searle exclaims: "Watson did not understand the questions, nor its answers, not that some of its answers were right and some wrong, not that it was playing a game, nor that it won--because it doesn't understand anything." Today, on 14 March 2011 on the other hand, Stephen Baker, author of "Final Jeopardy--Man vs. Machine and the Quest to Know Everything" took the opposing view and stated: "Watson is an early sighting of a highly disruptive force...one that can handle [information] jobs held by people." To the question of whether machine thinking is "real" thinking? Baker quotes David Ferrucci, IBM's chief scientist who when asked if Watson can think, responded "Can a submarine swim?" The analogy is a very good one. Just because a submarine doesn't swim like a fish or a person, doesn't mean it can't swim. In fact and in a sense, for the very reason that it doesn't swim exactly like a fish or person, it actually can swim better. So too with computers, just because they don't "think" like humans doesn't mean they don't think. They just think differently and again in sense, maybe for the very same reason, in certain ways they can think better. - Computers can evaluate options purely based on facts (and not get "bogged down" in emotions, conflict, ego, and so forth like human beings). - Computers can add processing power and storage at the push of button, like in cloud computing (people have the gray matter between their ears that G-d gave them, period). - Computers do not tire by a problem--they will literally mechanically keep attacking it until solved (like cracking a password). - Computers can be upgraded over time with new hardware, software, and operating systems (unlike people who age and pass). - We can evaluate things based on our conscience and think in terms of good and evil, and faith in a higher power (a topic of a prior blog). - We can care for one another--especially children and the needy--in a altruistic way that is not based on information or facts, but on love. - We can work together like ants in a colony or bees in a hive or crowdsourcing on- or off-line to get large jobs done with diversity and empowerment. - We are motivated to better ourselves and our world--to advance ourselves, families, and society through continuous improvement. Perhaps, like the submarine and the fish, both of which can "swim" in their own ways, so too both computers and people can "think"--each in their own capacity. Together, computers and people can augment the other--being stronger and more effective in carrying out the great tasks and challenges that confront us and await. 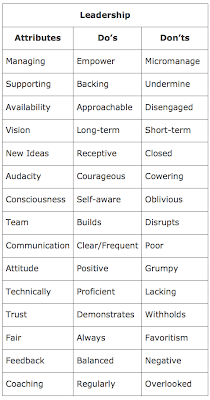 Below is a list of my top 15 recommended leadership attributes and the do’s and don’t for these. 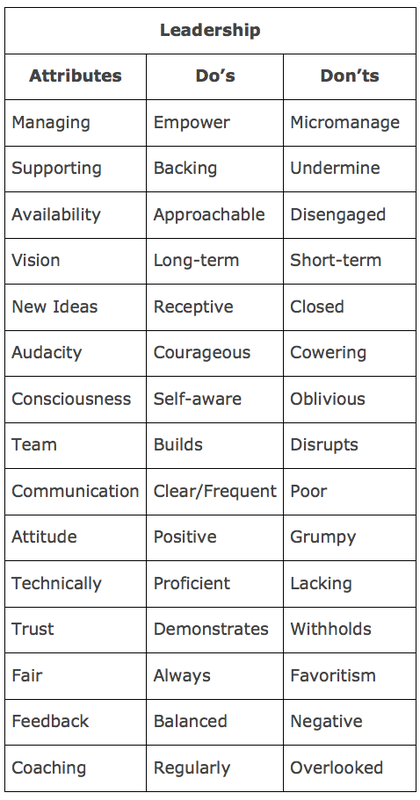 While the list is not comprehensive, I believe it does give a good starting point for leaders to guide themselves with. Overall, a good rule of thumb is to be the type of leader to your staff that you want your supervisor to be to you. Common sense yes, but too often we expect (no, we demand) more from others than we do from ourselves. This is counter-intuitive, because we need to start by working and improving on ourselves, where we can have the most immediate and true impact. Now is a perfect time to start to lead by example and in a 360-degree fashion—because leadership is not a one-way street, but affects those above, below, and horizontal to us. If we are great leaders, we can impact people from the trenches to the boardroom and all the customers and stakeholders concerned. That’s what ultimately makes it so important for us to focus on leadership and continually strive to improve in this. 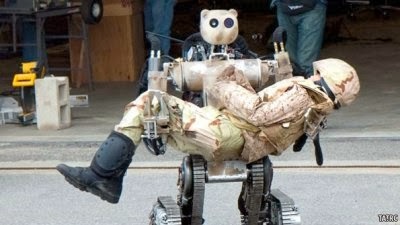 The Battlefield Extraction-Assist Robot (BEAR) developed by Vecna Technologies in collaboration with the U.S. Army's Telemedicine & Advanced Technology Research Centre (TATRC) is no teddy bear. The Economist (10 March 2011) says this it is "a highly agile and powerful mobile robot capable of lifting and carrying a combat casualty from a hazardous area across uneven terrain." And when BEAR is not saving wounded soldiers on the battlefield, it can perform "difficult and repetitive tasks, such as loading and unloading ammunition." The BEAR is a tracked vehicle that can travel up to 12 mph and has 2 hydraulic arms for lifting and carrying. It is controlled with a set of wireless video cameras and joystick control either embedded on the grip of a rifle or with a special glove that can sense the wearer's movements. This is great concept and I imagine this will be enhanced over time especially with the advances in telemedicine, so that at some point we will see the BEAR or its progeny actually performing battlefield medicine. One thing, however, in my opinion, the bear face on this robot undermines the seriousness of mission that it performs and it should be changed to look like a medic, it’s primary function. Love this concept on Civic Commons that was presented at the Gov 2.0 Summit (2010) and is now becoming a reality. Presented by Bryan Sivak the CTO for DC--Civic Commons is about governments collaborating and building technology once and reusing multiple times, rather than reinventing the wheel over and over again--a critical enterprise architecture principle. 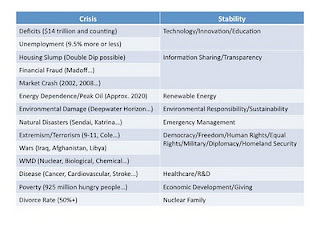 Governments have similar needs and can share common solutions--products and projects--for these. 1) DC and San Francisco building Open 311 (which I wrote about in a prior blog). 2) Minnesota building a $50 Million Unemployment Insurance System and then sharing it with Iowa who implemented it at less than 1/2 that. And more will be coming...all of which can be used and improved upon. It is great to see so many state governments collaborating--across the Nation--from Seattle to LA, Boston, San Francisco, NY, and Chicago. Moreover, they are coordinating with the Federal Government, as well as with supporting organizations, such as OpenPlans, Code For America, O'Reilly Media, and more that are helping with coordination, facilitation, and support. This is another great step in breaking down the silos that separate us and becoming more efficient in working together and learning to share what can benefit many. From potholes to garbage, broken street lights to vandalism...we want to get our community problems resolved. 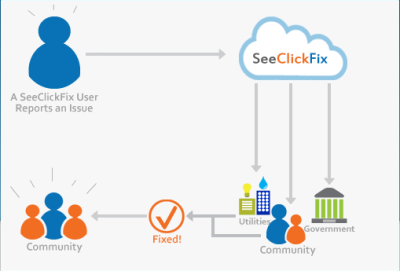 There is a good-looking application called "SeeClickFix" for connecting people and government to point out problems and get them fixed, fast. It works with iPhone, Droids, and Blackberries; integrates with Facebook and Twitter; and has dashboard reporting and alerts, as well as emails notifications to provide acknowledgements and status updates on issues. Built on the Open311 model, which provides APIs to existing internal systems and processes, so citizens report non-emergency issues to government based on standardized, open-access, and interoperable systems. "Using a mobile device or a computer, someone can enter information (ideally with a photo) about a problem...This report is then routed to the relevant authority to address...this information is available for anyone to see and...contribute more information...By making the information public, it provides transparency and accountability for those responsible for the problem." According to an article, iCitizen, in Fast Company (December 2010-January 2011), reported problems from citizen's smartphones or computers can even be routed straight to dashboard computers on public works trucks, "meaning a click in the morning can lead to a repair in the afternoon." Ok, this may still be more vision than reality at this time, but it is a noble vision, indeed! This is an evolution from 311 phones systems in many cities which are one way communications from individuals calling into government call centers and then waiting, waiting, waiting to see if the problem gets resolved to instead applications like SeeClickFix as a highly visible cloud solution where many people can openly exchange information over the Internet on public issues--providing more information, even potentially rating and ranking them (i.e. helping set public priorities for allocating limited public resources to community problems). This can even be coupled with suggestion platforms such as IdeaScale for crowd-sourced citizen input into urban planning and community health, safety, and livability issues. As part of its Apps for Democracy contest, DC awarded a prize and grant for the development of FIxMyCityDC, a web-based application for submitting service requests, checking status by interactive maps, along with the option of the user getting a call when the problem is resolved. This is huge progress from the prior endlessly annoying call centers and their Interactive Voice Response Units that previously took callers through a maze of pre-recorded numeric options that more-often than not ended in the users abandoning the call and service requests going unfilled. This is a far better model of information sharing, collaboration and transparency to solve real everyday problems in our communities, and a great example of the power of e-Government. I received this in an email today, and I thought this was worth sharing. "Take 5 minutes to read this. 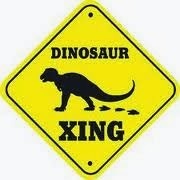 It may save your life or a loved one's life. After reading these 9 [actually 10] crucial tips, forward them to someone you care about. Chances are that he is more interested in your wallet and/or purse than you, and he will go for the wallet/purse. 3. If you are ever thrown into the trunk of a car, kick out the back tail lights and stick your arm out the hole and start waving like crazy..
C.) Look at the car parked on the driver's side of your vehicle, and the passenger side...If a male is sitting alone in the seat nearest your car, you may want to walk back into the mall, or work, and get a guard/policeman to walk you back out. The predator will only hit you (a running target) 4 in 100 times; and even then, it most likely WILL NOT be a vital organ. Ted Bundy, the serial killer, was a good-looking, well educated man, who ALWAYS played on the sympathies of unsuspecting women. He walked with a cane, or a limp, and often asked 'for help' into his vehicle or with his vehicle, which is when he abducted his next victim. He told her that they think a serial killer has a baby's cry recorded and uses it to coax women out of their homes thinking that someone dropped off a baby...He said they have not verified it, but have had several calls by women saying that they hear baby's cries outside their doors when they're home alone at night. 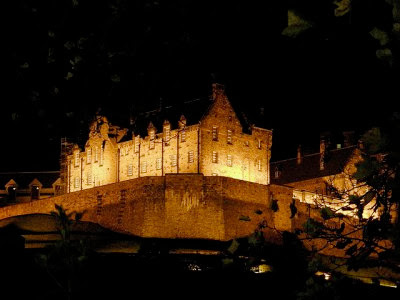 If you wake up in the middle of the night to hear all your taps outside running or what you think is a burst pipe, DO NOT GO OUT TO INVESTIGATE! These people turn on all your outside taps full ball so that you will go out to investigate and then attack. Someone sent me this cartoon today and I was moved by it. As much as we want to look to the future, it is important to remember the past and the many millions who perished in the most horrible and cruel way. 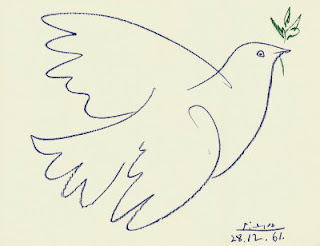 And as we continue to live in times of upheaval and extremism, the lessons of just 60+ years ago, of the Holocaust, are as relevant today as ever. As someone who is always looking at technology as the answer to everything (understanding of course, that all true answers come from above), this is a pause for me to question what if any are the limits to change and innovation? My hope, of course, is that we can rid ourselves of hatred, bigotry, intolerance, and extremism and instead work together for the betterment of all humankind. As long as our minds are blocked by hatred, we (in the collective) will never be able to realize our ultimate potential. 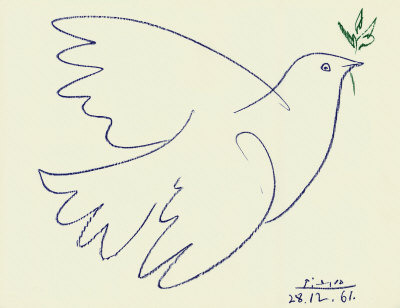 I believe in a future where we will ALL together achieve technological breakthroughs that will surpass anything that we can imagine today; where we will indeed travel--perhaps to the stars--together as one, not divided by race or religion any longer, but united in our commonality and strength and desire to achieve a future of hope, health, peace, and success for all. When Charlie Rose interviewed Ray Kurzweil, the renown futurist (BusinessWeek--March 7-13, 2011), Kurzweil assures us that in just 8 more doublings of solar power output (each, which is happening every 2 years), we will be able to meet 100% of our energy needs. This is the amazing power of the speed of exponential technology change to potentially solve our seemingly unsolvable human problems. As always, Kurzweil's optimism about our future is noteworthy. I hope that Kurzweil and the Prime Minister of Israel who discussed energy advice also shared insights about the prospect for Middle East peace. Let the amazing promise of technology coupled with the ultimate in faith (and a strong military deterent) bring genuine peace to us soon. Amen! Meet the latest and greatest military humanoid robot from Boston Dynamics--Atlas (aka PETMAN). 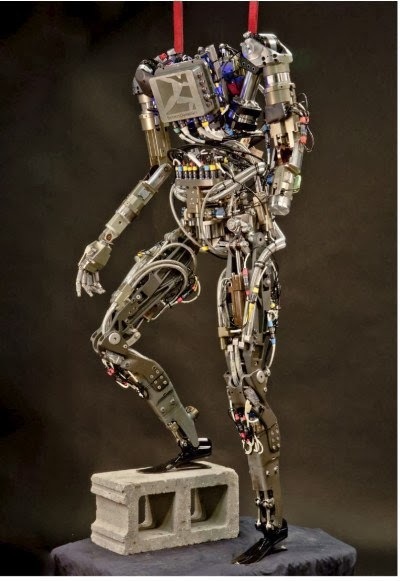 Watch the movement of the Atlas robot--it is JUST like a person: heel to toe walking. See what happens when you push it--Atlas reacts/recovers like a human would. I'm thinking Atlas should be pronounced like "at last" to recognize the amazing leap forward in robotics. This is great stuff--and it demonstrates our growing understanding of not only computers and robotics, but also of the physical and behavioral sciences. I just love all the new plug ins for the iPhone--maximizing it's use as a powerful handheld computer. Whether it's attachments for talking fingerprints and iris scans (from MORIS--that I wrote about in a prior blog) to running credit card payments (from Square), the iPhone has amazing versatility and almost endless practical use--as we are all coming to learn and enjoy. 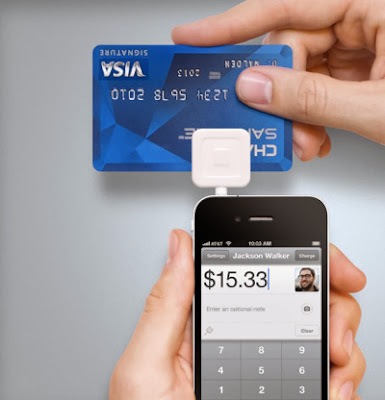 With Square, the simple credit card reader plugs right in to the headphone jack. Then by simply launching the app, users are ables to run payments through just as any professional business would. Simply type in the dollar amount, sign with a finger, send a receipt via email, and even display the GPS of where the charge was made--all done by mobile device and wirelessly. According to BusinessWeek (10 Feb 2011), smart-phone card readers will process $11 billion in payments this year and this is projected to rise to $55 billion by 2015. "Square charges merchants 2.75 percent of sales plus 15 cents per card swipe," but in turn creates new opportunities to sell remotely and transact business seamlessly. It is only a matter of time before hard currency becomes obsolete as electronic payments becomes easier and matter of course. My pockets are already empty and I do not miss the greenbacks--bits and bytes registering securely in the bank are more than fine by me. There is a new documentary called "Race to Nowhere." It is about our 24/7 culture with it's relentless pressure to succeed and how it is adversely affecting our children. Directed by Vicki Abeles a mother of one of these children, who was literally getting sick from from the "race to be the smartest, to test the highest, and to achieve the most." The message these days to children and adults is "produce, produce, produce." But what are we getting from all the hypercompetition? As one girl at the beginning of the trailer said "I can't really remember the last time I had the chance to go in the backyard and just run around." And another boy said, "School is just so much pressure, every day I would just wake up dreading it." This is not exactly the picture of happy, satisfied, and motivated children or of a dynamic workforce for the future. What are we doing to our children and ourselves? We have better technology and more information available now than ever before, yet somehow people are seemingly unhappier than ever--and it's starting with our children, but it doesn't stop there. With the change to an information society, our innovators forget to create a shut-off valve (or filter) so people would be able "turn down the volume" on the information pouring in 24/7. Adults can't keep up, our students can't keep up, no one can--we have opened the floodgates of INFORMATION and we are drowning in it. No learning is good enough because there is always more to learn and no productivity is productive enough because the technology is changing so fast. It's the same now everyday and everywhere for everyone, yesterday is history--when it comes to learning and achievement; the competition from down the hall or around the globe is right on our tail and if you are not doing something new just about every minute, you risk being overtaken. We know "failure is not an option" but is pushing until we have the equivalent of a societal nervous breakdown, success? Like with all good things in life--love, vacations, chocolate, and so on--we can't overindulge. Similarly with information overload and work--there has to be a "balance," a happy medium--we can't push the engine until it overheats. We need to know when to put the peddle to the mettle and when to throttle back. If we can handle ourselves more adroitly in these competitive times (and less like a flailing drowning victim running frantically between activities), manage the flow of information smarter (not like sucking on the proverbial firehose) and alternate between productivity and recuperation/rejuvenation (rather then demanding a 24/7 ethic), I think we will see greater joy and better results for ourselves and our children. We can all excel, but to do so, we have to learn to moderate and take a breathe--in and out. Success and happiness is not always about more, in fact, I believe more often than not it's about an ebb and flow. Like night and day, the ocean tides, the changing seasons, even our own life cycle, we have to know enough to compete intelligently and not with brute force, 24/7, alone. So what if we turned off our Blackberry's for just a couple of hours a day and let our kids do the equivalent...to be human again and find time for spirituality and community and rejoice in all that we have achieved.